Homeowners with medium or large properties can attest to how difficult it is to maintain the property with an ordinary lawn mower. It is not only time-consuming, but pushing on uneven terrain is tedious, and physically demanding. Often, you are forced to pay exorbitant fees to hire a professional for a professional look and to avoid the dirty work. Maintaining your garden doesn’t have to be such a hassle though. You can save a ton of money, use less energy and time, and still get that desired expert look by investing in a ride-on lawn mower. A garden tractor is a workhorse. Its durability is unmatched and is quite convenient. In the following piece, we have the ten best riding lawn mowers, their pros, and cons, as well as what to look for before making a purchase. If we missed anything, do let us know in the comments section. •	Power and incredible turning radius – Despite it being a small machine, it packs quite a punch. It will cut through even the tall wild grasses. The 18-inch turn radius will also help you get a lot closer to obstacles than any push-option can. •	Ease of use – Mowing is a rather easy task. It’s just like driving, but you don’t need a ton of experience to be an expert. A few mowing sessions and you can rival any professional. However, the Troy-Bilt is easier to use than most other units. The auto-choke engine will give you a no-fumble start and go experience, and the neutral gear allows you to start slow as you learn the other controls. Another interesting point concerning the Troy is its adjustable ergonomically designed seat. You can fine-tune the height to your convenience. Also, the 13-inch steering wheel features a soft grip and is adjustable to 3 positions depending on the stature and expediency. You might also be interested in the varying blade heights that make choosing the ideal grass height a breeze. The Troy-Bilt is for homeowners who have a limited storage space and whose lawn does not exceed 2 acres. The garden too should be even. As for the price, it is well within the affordable range and will take you about an hour to assemble. If you have a huge lawn, say between 2 and 3 acres, and intend to clean up the entire mess in a day, you might be interested in the YTA18542. Going forward, it can do speeds of 7.4 miles per hour and 2 MPH in reverse. With its 540cc engine, it can produce about 18.5 horsepower. It also features a 42-inch deck and has a 16-inch turning radius. What’s most interesting though is its airflow induction technology and ease of use. •	Air induction technology – The Husqvarna was made with performance in mind, and the air induction tech helps achieve this. By boosting air flow within the deck, it maintains a consistent cut. The airflow also increases the efficiency and convenience of the machine over extended periods of time. •	Ease of use – It’s highly unlikely that you will find another smooth riding option within this price range. First, it has a step-through design meaning you can mount the machine from the left or the right. The ReadyStart system eliminates the need for a choke, and you can power the YTA18542 by a button or a key. Finally, the advanced debris management system will deflect any foreign debris from the system to avoid any problems. Another interesting detail is how easy it is to get the Husqvarna ready. The 18.5 horsepower allows the YTA1854 to handle undulating landscapes exceedingly well. Nevertheless, you will encounter some problems if the slope exceeds 15®. Also, you can adjust your cutting height to be between 1.5” and 4” tall. The deck wash port makes this tool easy to clean as it allows you to connect a water hose to its underside. The YTA18542 is for homeowners with medium sized lots that are slightly inclined and are free of obstacles. It’s also for homeowners who want to cut and clear the mess in a day. As for the price, it is excellent value for money. •	Coat corrosion defense system – This coat prevents the wear and tear of the machine, and thus you can work during any weather and almost any environment. •	Versatility – With a remarkable 16 inch turning radius, and the exceptional responsive steering wheel, you can quickly cut around objects, and deal with tight spots. Also, you can use it for more than grass cutting with the multi-seasonal attachments. Though they are sold separately, you can clean snow off your driveway and even attach a shade during summer. Some other aspects you might be interested in are the operator presence sensor, the reverse safety switch, and the brake pedal lock. You might also like the washout port that makes cleaning the deck a breeze and the 12 cutting height positions with a quarter inch increments engaged with a single lever. You can also adjust the spot of the ergonomic seat by moving it forward or backward. The LT42 also features a hydro-release gear that allows you to reposition it by pushing it. The cup and tool holders are also lovely additions as is the cruise control. The XT1 Enduro Series LT42 is for medium to large property owners whose grounds are uneven. As for the price, it is an affordable machine. If you are looking for a machine that cannot only mow but also till you might want to consider the Poulan Pro 960420186. It is designed to handle large properties thanks to its 24HP engine and can manage any terrain. 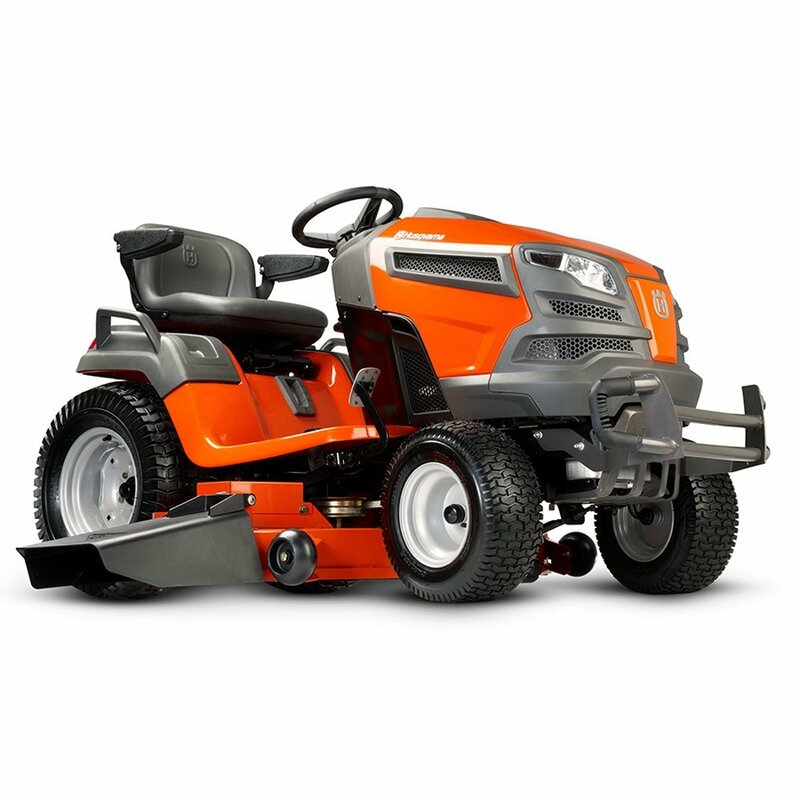 By and large, it offers everything from the lower cost Poulan Pro mowers but with a more massive deck and a competitive price. We especially like the air induction and ReadyStart system. 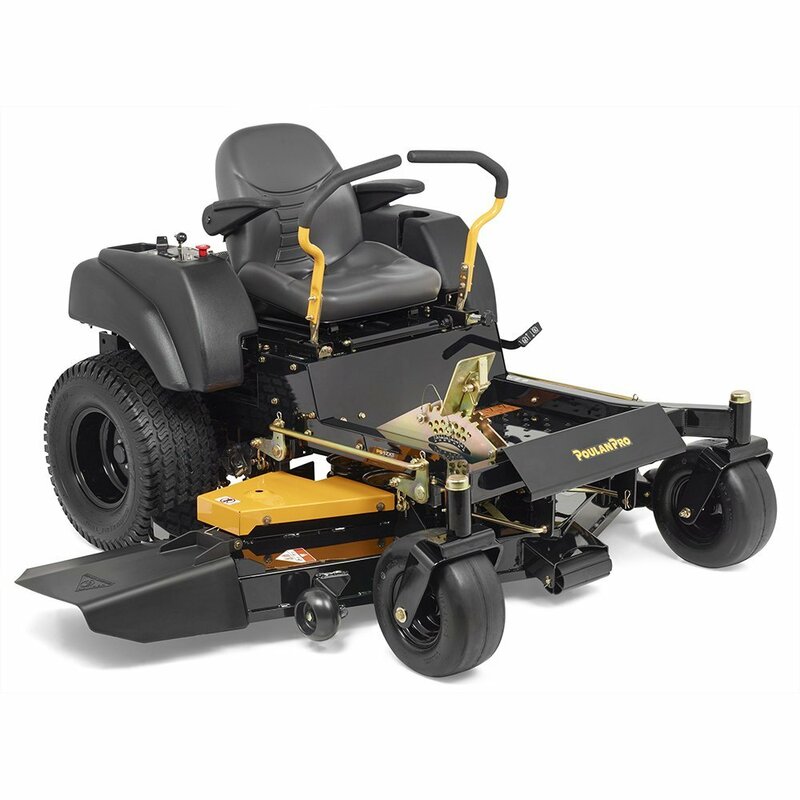 •	Air induction – The air induction system is a rather innovative technology as it increases the airflow in the deck lifting the grass for a premium cut. •	ReadyStart system – It makes starting the machine a walk in the park. There is no need to prime it since it will adjust itself to the appropriate fuel levels. You might also be interested in the pressurized lubrication and crossflow cylinder. It reduces the vibrations for quieter operation and also prevents overheating. The cutting height is adjustable in 6 positions and the deck fitted with four anti-scalp wheel which keeps it level with the help of a nose roller. Also, the 54” floating deck has a triple blade and is stamped and reinforced. You might also like the washout port which makes cleaning the deck a breeze. The 960420186 is for homeowners with large lots, 3+ acres that are uneven. The XTR2460BS happens to be another premium zero-turn option. 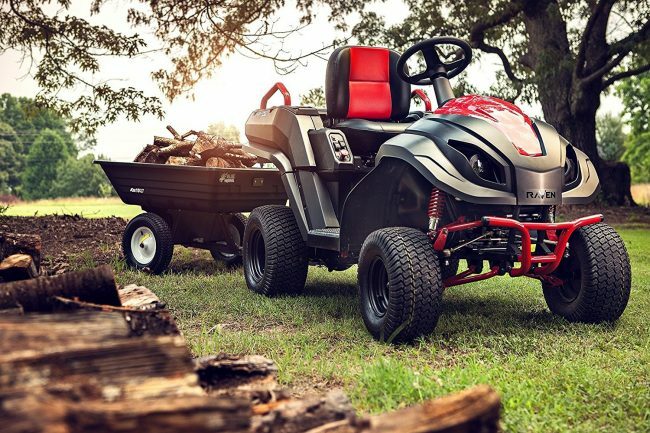 It has a 60-inch deck and a Briggs and Stratton engine that makes mowing a large lawn a breeze. The 24 HP engine is quieter and thus great for areas where silence is crucial. It is also more reliable and durable. 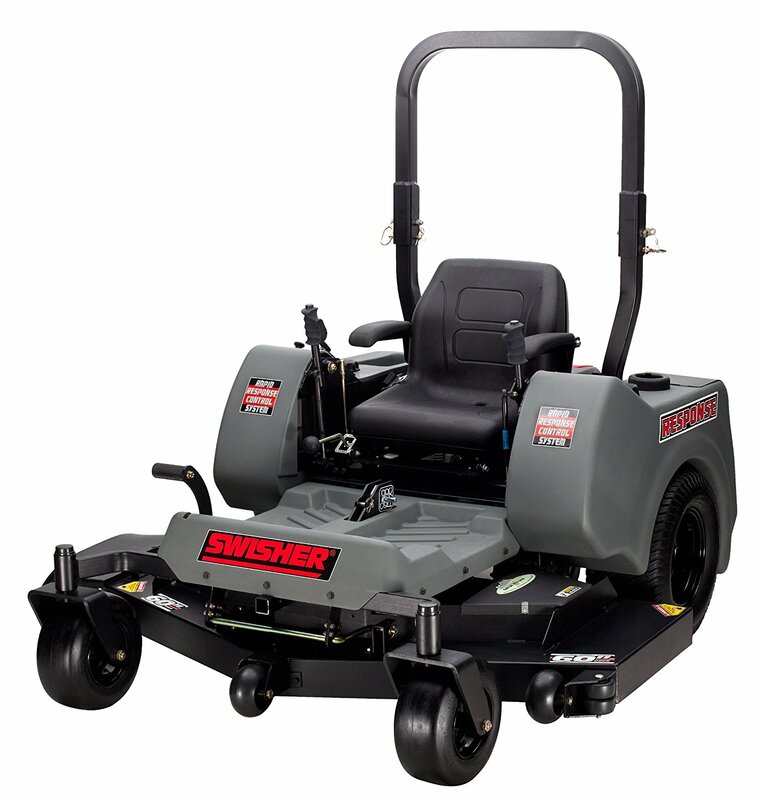 •	60-inch deck – One of the most noticeable aspects of this Swisher is the deck, it allows you to mow large spaces with fewer passes. However, what caught our attention are the gator mulching blades. They not only make quick work of any grass but reduce it to mulch. •	Ease of use – Working with the ZTR2460 is a walk in the park. You control all your wheels with a joystick, and the rapid response control system will give you a fast electric start. You might also like the hydro gear 2800 transmission as it gives you more control and maneuverability to work around obstacles. It’s fast too and can do 8 mph while moving forward and in reverse. This is way better than other options. This is a machine for a homeowner with a flat lawn and is willing to spend an extra dollar. If you are in the market for an eco-friendly option, you might want to consider getting the MPV 7100. You can use gas or electricity as fuel, and the latter is environmentally friendly. The 420cc gasoline engine powers the generator which charges the batteries and powers the blades. You might also be interested in this machine as it is 3 in one. You can use it as a generator, a land mower, or a power generator. How cool is that? •	Generator – What we liked most about the MPV7100 is the 7,100 watts generator. You can use it for more than mowing your lot. The generator can be used to power tools such as saws and drills as well as powering your house in case of a blackout. However, despite being a 7,100 watts machine, it peaks at 6,500 when operating and runs for 8 hours at 50% load. •	Eco-friendliness – The second noticeable thing about the Raven MPV7100 is its eco-friendliness which any conscious person will enjoy. Another fascinating aspect of this tool is its 550lbs carrying capacity. You can transport work supplies to any work site or tow away debris. It has a top speed of 17mph which will come in handy when working on large lots. It also features cruise control up to 6mph and high-intensity lights that will help when working in low light conditions. The 46-inch removable deck is nothing short of amazing and discharges debris appropriately meaning you will not have to suffer from clamping. You have 10 cutting height positions from 4 inches, and a 14-inch turning radius which is almost as good as a zero-turn radius option. The ATV off-road style tires provide traction to operate on uneven ground. All things considered though, it will still not cut grass properly on rough terrains as it lacks rear suspension. The Raven MPV7100 is ideal for owners with small or medium lots that are relatively even. If you are looking for a machine that can double as a snow thrower, then you will love the GTH52XLS. However, we advise you purchase it only if you have a large lawn (upwards of 3 acres). Also, if your yard is jagged with steep hills, this is the machine for you. •	Power – The GTH52XLS is a heavy duty machine, and the unmatched power is perhaps its most appealing aspect. It will mow uphill at top speed with ease and manage to pull a trailer uphill effortlessly, and the locking rear wheels grip is insane. 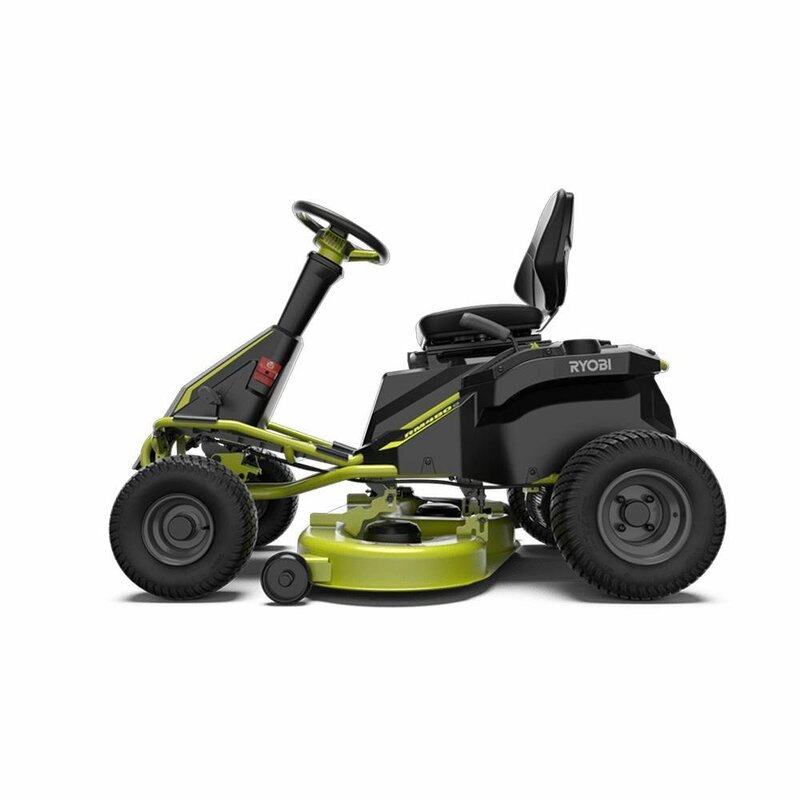 •	Versatility – You can use the GTH52XLS for more than mowing. That versatility is what most homeowners prefer. It is especially ideal for driveway maintenance and gardening. You might also love the seat. It is a high back seat, adjustable, and has arm sets. The steering wheel is manufactured with comfort in mind. You can operate for long hours without worrying about fatigue. It mows in reverse to at a top speed of 2 mph with a seven mph top speed when moving forward. The cutting blades are adjustable to 3 positions and are electrically engaged. You will also like the fast auto-transmission that allows you to change speed with foot pedals plus the convenient fender mounted deck. 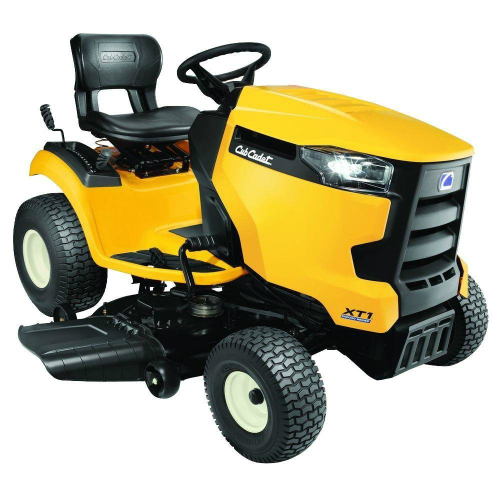 The GTH52XLS is for people with large lawns that have steep slopes. It’s also not for people who are on a budget as this machine is rather expensive but worth it. Not this is for the more eco-friendly property owners. For a moment, battery-powered options have been elusive. The earliest versions were too expensive for the average homeowner. However, there have been some developments in the sector, and now we have the Ryobi which though still expensive, is far cheaper than the predecessors. Also, the convenience it offers is worth it. •	Battery powered option – The Ryobi being battery powered is its most impressive feature. It uses four 12V batteries giving you a 48V system. This is enough to power the Ryobi for 2 hours, enough to get through 2 acres of land. Also, it requires zero or no maintenance. There are no spark plugs, air and fuel filters to replace, the brushless motors that drive the engines run on direct drive, and thus there are no belts to maintain, and since it doesn’t use gas, there are no fumes to deal with or winterization. •	Control panel – We also loved the control panel as it is more advanced than on other options, and resembles riding a high tech golf cart. The LED gauges are easy to read, and blade engagement is even more comfortable. It also has an override feature for when you are mowing in reverse. You might also be fascinated by the cruise control. All you have to do is set your preferred speed and activate it. The Ryobi also features scalping wheels that will keep the deck and blades from digging in when it comes to uneven ground. And speaking of the blades, you can adjust them to twelve positions from 1.5 inches to 4.5 inches. The Ryobi is ideal for owners whose lawn is 2 acres or less, and don’t mind spending the extra dime. It’s also suitable for people looking for an eco-friendly option or a tool that requires little or no maintenance. 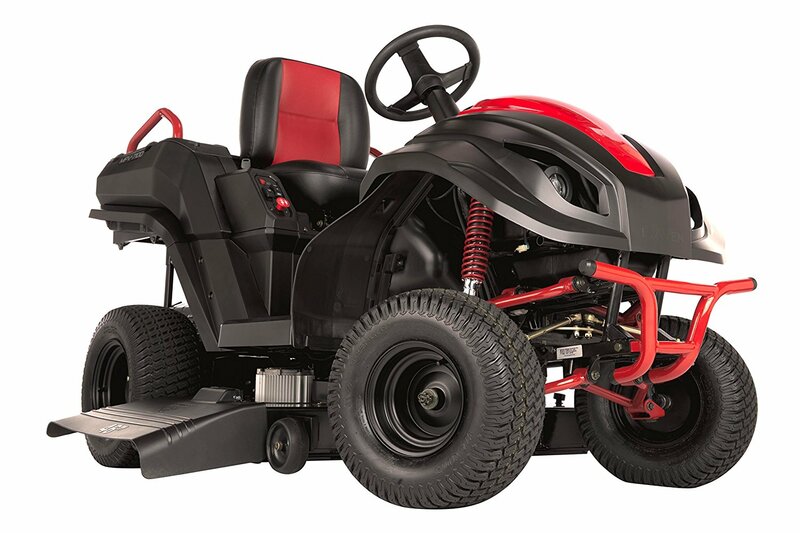 •	6-inch turning radius – Of all the reviewed riding mowers, the Poulan Pro PP20VA46 has the best turning radius of 6 inches. You can find your way around any obstacles effortlessly. •	Wheels – The wheels are anti-scalp reducing the likelihood of you damaging your lawn even when working on uneven ground. The rear wheels also feature a turf-saver tread so as not to harm your grass, and also provide excellent traction and comfortable cruise. Another aspect we found interesting is the 46” 13-gauge deck plus the cast iron front axle. The two increase the stability, longevity, and solidity of this machine. The deck also has six cutting positions thanks to its spring assisted deck lift. It also mows in reverse saving you time. We also liked the four cycle/2 cycle switches that will help you cut wet or dry grass in a manner that ascertains longevity. There is also no need to prime the unit thanks to the ready start system. The PP20VA46 will make quick of any mowing task, and even tall grass is not a problem. Also, the CVT transmission allows it to handle slopes with high precision. The 46-inch deck draws air from the top and keeps it flowing even when cutting long grass. The PP20VA46 is ideal for property owners with around 2 acres. It is also an affordable machine. Next on our list of best riding lawn mowers is the Poulan Pro P54ZX. If you are looking for a zero turn radius option, then this is the machine. It not only allows you to get close to hedges and obstacles but is also powerful to handle debris and hilly terrains thanks to the 24HP Briggs V-twin pro engine. •	Ideal for large lawns – First, it is a powerful machine, and it can handle the abuse associated with cutting a vast garden. Secondly, it has a large fuel tank that allows you to work for long hours without having to refill. Finally, the seat is comfortable enabling you to work extended periods without fatigue. 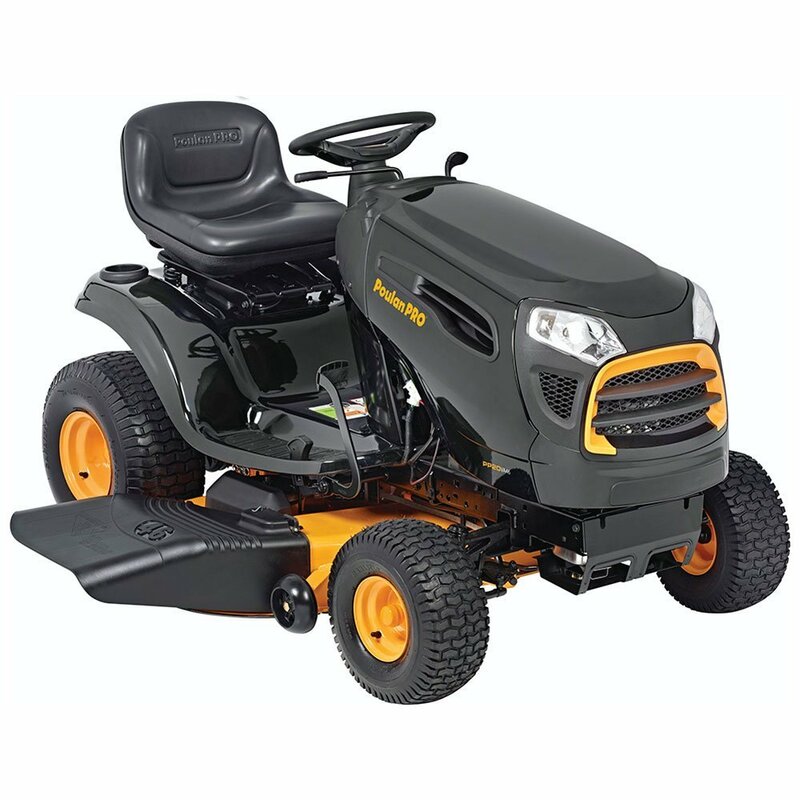 •	Fast mowing – The 24 HP engine will make quick work of any grass, and the zero turn radius reduces the time you use navigating obstacles and turns with traditional mowers. The 54” deck is also worth mentioning is it is reinforced steel for longevity and has cutting heights from 1.5 inches to 4 inches. The Pro P54FX is ideal for homeowners with extensive lawns, upwards of 3 acres and wants to finish the job in a day. You might also want to consider it if you have hilly terrain. It happens to be a tad pricey though. Always consider the features that are important to you. The type of lawn you have determines the aspects of the lawn tractor. If you have a flat home turf, your choices are nearly unlimited. However, most homeowners have undulating yards. Consider the number of obstacles, how vital maneuverability is to you, the cutting path, whether or not you need to bag the grass, etc. Below are a few features that you should take into account. Handling – Garden tractors have different configurations for different yards. 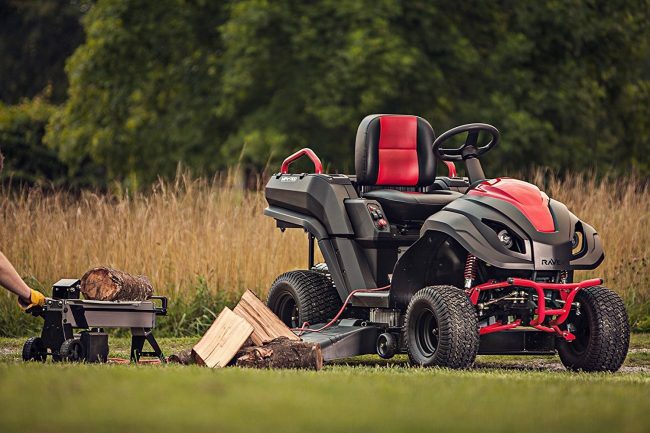 Depending on your yard type, you can purchase a zero-turn handling, a front drive, or a rear drive. Speed – If you have a vast open ground, you will need a machine that will get the job done quickly. On the other hand, you will need to slow down if your lawn has obstacles, say trees, shrubs or flowers. However, other than having to choose between a fast and a slowone, look into multi-speed units. These can slow down around obstacles, and when cutting long or wet grass. Also, they speed up on open grounds or when cutting shot and dry grass. By and large, the multi-speed systems save time and increase efficiency. Cutting Path – Garden tractors have an array of cutting widths. The deck size is equivalent to the cutting width. Therefore, select a tool that will match your cutting path. Most homeowners make the mistake of only considering the engine power when making your purchase. There more issues to look into if you want a machine that will serve you better longer. First, consider the cooling system. 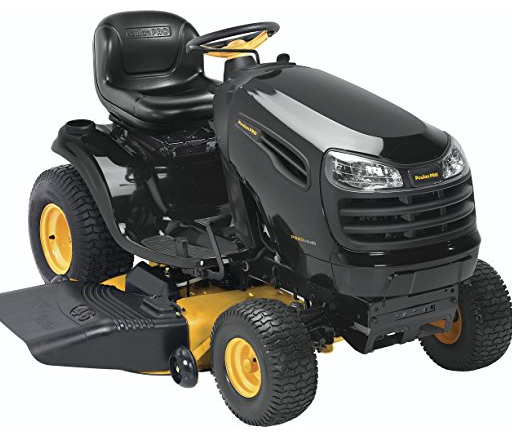 Purchase a lawn tractor that keeps the engine temperature down as it will extend the life of the machine. The oil system is something else you should look into. Not only should it be effortless to change the oil, but the filtering system too should be top-quality lengthening the time between oil changes. Think about the air filters too. They should be easy to access and DIY. Finally, consider the fuel type and whether it’s a twin or single cylinder engine. On the topic of fuel, it can either be petrol or fuel. We advise you purchase a diesel engine one as is cheaper to run and has more torque than a gasoline powered one. About the cylinders, you will get more power from a twin cylinder engine over the single cylinder. 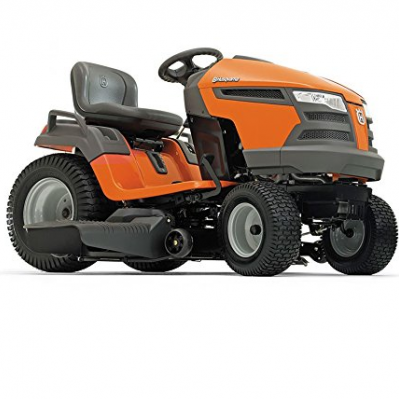 You will probably find horsepower, torque, and engine displacement on most ride-on lawn mowers. The power is what moves or accelerates the machine. Torque, on the other hand, is a force. It gives it the might to keep turning the blades even under stress. Thus, if you reside in a slightly wet area or you don’t plan on mowing your lawn often, we advise you get a machine with higher torque. You will also need more horsepower if your property is undulating. Otherwise, don’t spend exorbitant amounts of money on a garden tractor if you reside in a dry area, if your yard is flat, or if you will be regularly cutting your grass. When choosing a transmission type, you can choose between manual, automatic or hydrostatic transmission. An automatic one works like an automatic transmission vehicle. They are easy to operate and especially if you have many obstacles on your property. They will slow down around trees and shrubs without sacrificing speed on open ground. A hydrostatic transmission works like the automatic transmission. The only difference is that the hydrostatic option uses fluids to transfer power to the wheels, unlike the automated system which uses belts. As a result, the hydrostatic rides are smoother, and the machines last longer with little maintenance. Finally, we have the manual transmission mowers. These use a clutch and gears to change speed. They are ideal for homeowners with large open yards and are cheaper than the rest. Aerators to aerate your lawn. Sweepers – These tow-behind sweepers to brush up the clippings and leaves. Dump carts that help you move items across the yard. Riding lawn mowers aren’t exactly cheap. Yes, some are more affordable than others, but it is still a considerable investment. You want to know the warranty the manufacturer has in place before you make a purchase. The manufacturer too could have insured some parts, e.g., the transmission belt. You want to check that too. Is the machine assembled or do I have to do it myself? Some of these mowers are easy to put together while others are challenging. 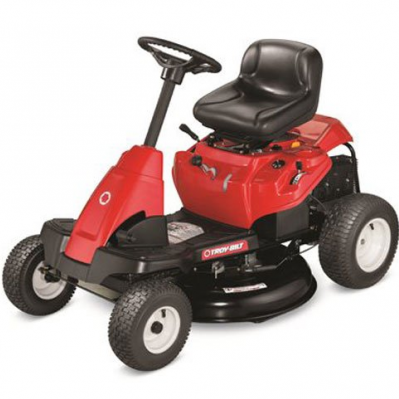 A great example is the Troy-Bilt premium ride-on. Despite being exceptional value for money, it takes close to an hour to assemble with the right know how. If not, it will take you longer. You might also want to consider if the delivery person will put the item together for you. By and large, assembly should be one of your key concerns when purchasing one. What should my routine maintenance look like? Check your engine oil to ascertain that the levels are appropriate. Too much or too little oil can damage the engine. Also, check the air filter before you mow. Experts also advise you replace your air filter, spark plugs and oil filters annually. What parts often need to be replaced? Eventually, some components will wear out. The most affected parts are the grass catcher components, the trail, discharge cover and the blades. With worn out blades, you will only damage your lawn. The rest of the parts can expose the moving components or throw objects damaging the machine. Regularly check for damaged components and replace with original equipment manufacturers parts so as not to compromise safety and performance. Well, this depends on what you intend to use it for. If it’s solely for cutting grass, there is no need for attachments. However, you might want to use it to clear your driveway, or for gardening. If you plan to use it for more than mowing, you will need to purchase the necessary add-ons. Cutting your lawn doesn’t have to be an arduous task. With the appropriate tools, you can quickly trim any grass. Getting the right option depends on you and your preferences, but there are some guidelines you can follow to ensure you purchase a premium product. Our list points out some of the best riding lawn mowers in 2018, but you can use it just as a guideline. If we have missed any topoption, let us know in the comments below.